The Kia Sedona is a four-door seven-passenger minivan. The Kia Sedona first arrived on the market in 2002 and stayed relatively the same for four years. It was marketed on the premise of offering the most features for the least money. It gained a solid reputation as a quality built solid vehicle with great crash test results. On the down side, it was heavier and lacked a responsiveness that the competition had. The old Sedona had less cargo space due to the rear seats but it was considered to be spacious for passengers. There were few changes made over these initial years and all of them were minor like a newly designed taillight style. The Kia Sedona is offered in three trims. The shorter wheelbase Sedona only comes as a base model and the standard wheelbase Sedona comes in a LX or EX trim. The shorter wheelbase is over a foot shorter than the longer version. When outfitted correctly, the Kia Sedona can tow up to 3,500 pounds. The second generation Kia Sedona minivan came out in 2006. The performance on this vehicle was improved by 50 horsepower and the engineers removed close to 400 pounds from the frame. The 2007 model received a slightly larger engine and a shorter wheelbase as well as a lower price tag. Under the hood of the current of the 2008 Kia Sedona is a 3.8 L V6 engine offering 250 horsepower and 253 lb-ft of torque. This engine is paired with a five-speed Sportmatic automatic transmission with overdrive that allows the driver to select gears. The power is more than adequate and the newly engineered suspension has given the Sedona a lighter and smoother ride. This model is longer and compares in size to the Honda Odyssey. Like most in the same class, the mini-van offers loads of legroom in all three rows of seating. The cargo area is also more than adequate for large families offering 32 cubic feet on the LX and EX with many small storage compartments around the inside of the vehicle for convenience. The EPA fuel economy rating for the Kia Sedona is 16 miles per gallon in the city and 23 mpg on the highway. 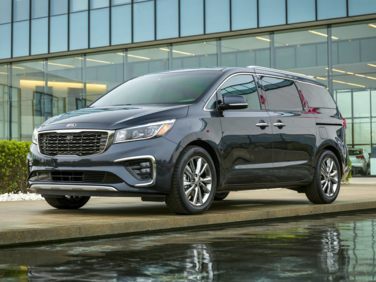 The base trim of the Kia Sedona comes with three-zone air-conditioning, a full complement of power features, keyless entry and a basic CD player. The LX has those features but also comes with a fold-to-the-floor back row of seating and more cargo space. Then step up to the EX for additional power-sliding doors, and a power liftgate fog lamps, power front seat, leather-wrapped steering wheels a trip computer, alloy wheels and even a roof rack. Other features that shouldn’t be ignored are the design features of side impact door beams, impact-absorbing steering column and front and rear crumple zones. There is a Convenience package available as well. The Kia Sedona has a full complement of safety features. For all the Sedona trims there is six standard air bags, including front seat mounted side air bags, full-length side curtain bags that cover all the different rows of seating. There are active front head restraints to minimize the danger of whiplash. In addition, included standard are anti-lock brakes with electronic brakeforce distribution, stability control and traction control systems. In the government crash tests, the Kia Sedona received a perfect five star rating all across the board. In the rollover resistance rating tests, the vehicle received a four star rating.